In shallow glass or plastic dish or resealable food-storage plastic bag, mix cilantro, oregano, lime juice, oil, chili powder and garlic. Add chicken, turning to coat with marinade. Cover dish or seal bag; refrigerate 30 minutes to marinate. Heat gas or charcoal grill. Remove chicken from marinade; reserve marinade. Place chicken on grill over medium heat. Cover grill; cook 15 to 20 minutes, brushing with reserved marinade and turning occasionally, until juice of chicken is clear when center of thickest part is cut (at least 165°F). Grill bell peppers and onions 10 to 15 minutes, turning frequently, until crisp-tender. Discard any remaining marinade. 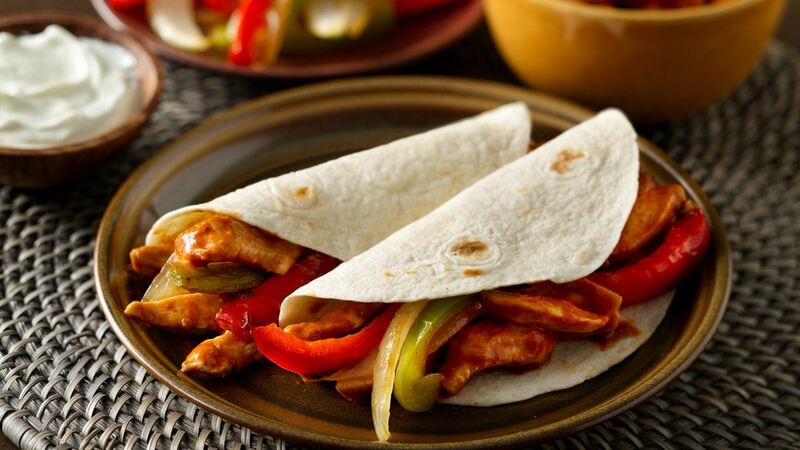 Cut chicken and bell peppers into strips; divide chicken, peppers and onions evenly among tortillas. Fold tortillas over filling; serve immediately.